This statement (consisting of 3 pages and signed by me) is true and in accordance with my understanding. I am the person referred to above, resident at the address previously provided to the Leicestershire police. 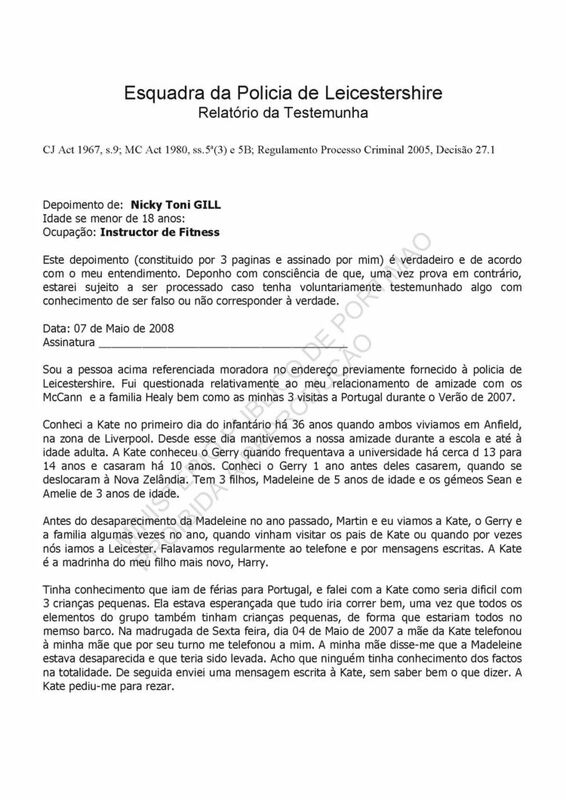 I was questioned in relation to my friendship with the McCanns and the Healy family as well as about my three visits to Portugal during the summer of 2007. I have known Kate since the first day of primary school 36 years ago when we both lived in Anfield, in the Liverpool area. Since that day we have maintained our friendship during school and adult age. Kate met Gerry when he would visit the university almost 13 to 14 years ago and they married 10 years ago. I met Gerry 1 year before they married, when they moved to New Zealand. They have three children, Madeleine aged five and the twins Sean and Amelie, aged three. Before Madeleines disappearance last year, Martin and I would see Kate, Gerry and the family several times a year when they came to visit Kates parents or sometimes when we went to Leicestershire. We would regularly talk on the phone or send messages. Kate is the godmother to my youngest son, Harry. I knew that they were going on holiday to Portugal and I talked to Kate about how difficult it would be with three small children. She was hopeful that all would go well, as all of the members of the group also had small children, and that they would all be in the same boat. Early on the morning of Friday, 4th May 2007 Kates mother phoned my mother who, in turn, phoned me. My mother told me that Madeleine had disappeared and that she had been abducted. Nobody knew the full facts. I immediately sent a text message to Kate, without really knowing what to say. Kate asked me to pray. On the following night at about midnight, Kate contacted me by phone, she was devastated and appeared lost. She said that judging from the action of the local police, one would think that she "had lost a dog". Her situation was one of desperation. I then asked her by means of text message whether she wanted me to go over and join them, to which she responded yes. She then told me that another friend, Michelle Thompson, was also going. Michelle and I got in touch with each other and agreed to travel together. During the following 24 hours we kept in contact by means of text messages, but I spoke with Gerry on Saturday morning and he seemed to me to be in a nervous emotional state. He asked me to bring them some warmer clothes. Michelle and I travelled from Liverpool directly to Faro early on Sunday morning. We were met at the airport by representatives from Mark Warner who took us to the Ocean Club resort. We stayed in an apartment on the top floor of the same block where Kate and Gerry were staying. We met up with Kate and Gerry at midday the same day. Kates appearance was terrible, she looked exhausted and worn out. They were talking to Alan, a psychologist provided by Mark Warner. I looked out of the terrace window of the apartment and expected to the place full of police, but there was nobody, just a helicopter flying over. Sometime later Gerry and Kate went to fetch the twins from the creche, trying to maintain the most normal routine possible. During the time we were there, we tried to help out in we could and maintain some normality for the twins. On Monday morning, Fiona Payne knocked on our door and told us that there would be a search organised by a resident, Dave, we agreed to join the search and went with about 10 other people in a mini bus. We spent the morning searching grounds and areas of difficult access surrounding the resort, but I dont know where the exact location was. There was no police involvement in these searches, but I think that Dave was in contact with the local police. Later that day Kate phoned to ask whether Michelle and I could help look after the twins. We entertained the children between the two of us that afternoon. On Tuesday midmorning I was in the supermarket with Michael Wright when a man entered and asked loudly where GMTV was. The place was full of people from the press. I spotted him later sitting in the bar with GMTV reporters, but I didnt see him again during the rest of my stay in Portugal. I looked at him but I did not know who he was. It was only upon my return to England that I discovered from the news that the man was Robert Murat. I returned home on the following Saturday, 12th May 2007. Following my return I maintained almost daily contact with Kate by means of text messages and sometimes by phone. When we contacted each other I tried to be as positive as possible and raise her morale. I had told Kate that if it was necessary for us to return to Portugal, she only had to ask. At the end of June I think Sandy and Trish had to return to their home to deal with some matters and Kate phoned me to ask whether I could help them during their absence. Another friend, Linda McQueen and I travelled together on 26th June and returned on 29th June. We stayed in the apartment that Sandy and Trish had occupied. Once again we were there to provide as much positive support as possible. My other trip to Portugal was in August, but I cannot remember the exact date. At that time Kate and Gerry had left the Ocean Club and had rented a villa. I travelled alone and Gerry came to pick me up from the airport in a hire car, also alone. I stayed with them in the villa and once again helped take care of the twins when they had meetings, etc and I offered them the best emotional support that I could. As regards the accommodation during my visits, I never noticed anything strange in any of the places. With regard to the contact I had with the couple, I would say that I saw Kate and Gerry every day in the morning and at the end of the afternoon and if they were not in meetings we would be together. With regard to their behaviour, I do not understand how they managed to keep functioning, given the circumstances, how they managed to keep going. Kate was in a very unstable emotional state. Gerry appeared to be more concentrated on what needed to be done but he also had his moments of greater depression. With regard to the car hired by Kate and Gerry, it was a Renault Scenic, but I think that they only had it when I travelled to Portugal for the last time. I would be transported in the car daily, given that the villa was located outside of the resort. There was nothing strange about the car, I never noticed any unusual odour. There was no way in which Kate and Gerry could have hidden Madeleine and then have transported her body to another place. They were never alone and had the worlds press literally camped at their door. Kate and Gerry never placed the children at risk and I know that they adored Madeleine and the twins, because they both very much wanted to have children. They both loved their children, Madeleine meant everything to Kate and in my opinion they are both excellent parents, totally devoted to their children. This statement was made by me and is truthful in accordance with my understanding.